Australia: Black African on train tells Arabs “you bring crime here, go back where you came from”……. – The Tundra Tabloids……. Australia: Black African on train tells Arabs “you bring crime here, go back where you came from”……. 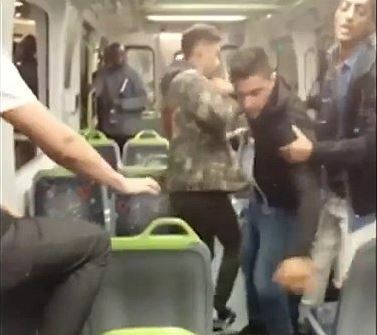 A brawl that broke out on a Sunbury line train in Melbourne between a group of four men, was reportedly started after a man yelled racist insults at a group of three men nearby. A witness said man who was attacked, had accused the other three men of being part of ISIS. The witness told 7 News: ‘He (the African man) said ”Go back to where you came from” and ”All immigrants are a problem to this country and you bring all the crime here”.’ Transit guards and police spoke to the men but each blamed the other and none wanted to press charges or take the matter further. Previous Post Previous Post Gatestone: A Month of Islam and Multiculturalism in Britain, March 2017……. Next Post Next Post Jordan Peterson on Mark Styen show about Orwellian perversion of language……..